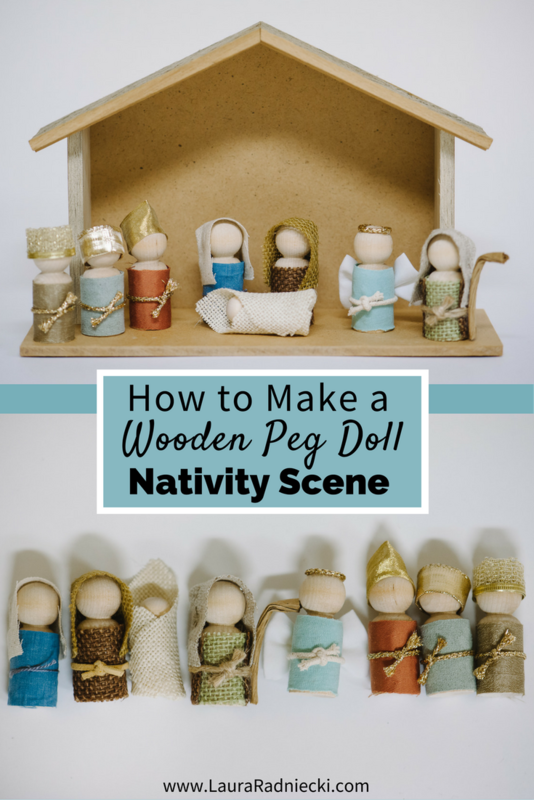 A step by step tutorial on how to make a wooden peg doll nativity set. 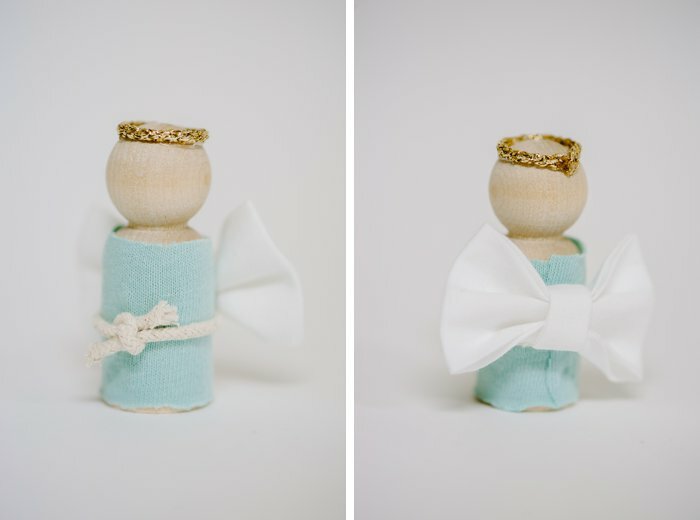 A simple DIY nativity scene that is perfect for kids, and beautiful for your home too! 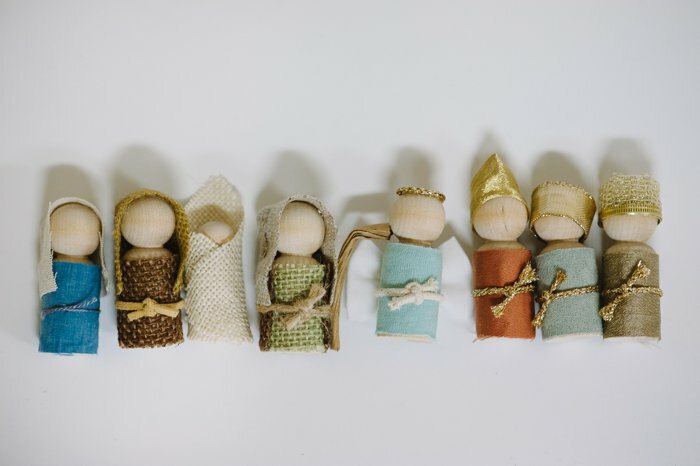 Last year around Christmas time, I pinned a few kid-friendly Nativity scene ideas on Pinterest, thinking they might be fun for the future. My criteria were easy, cute and not breakable. Must-haves with kids. 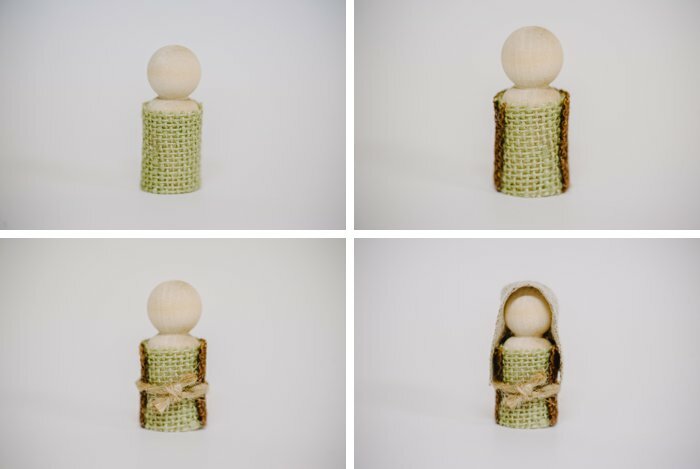 When Christmas rolled around this year, I decided to try out one of the ideas: a rustic, Willow Tree People-inspired Nativity scene made from wooden peg dolls and fabric scraps. I used this post as the inspiration behind my set. I loved the set I made so much that I made several more to give away as Christmas presents. 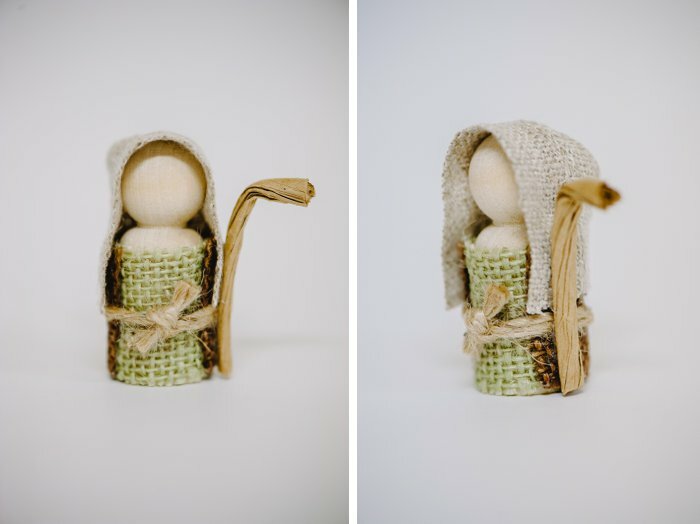 I photographed the process, so here’s a tutorial on how to make a simple, rustic wooden Nativity scene! 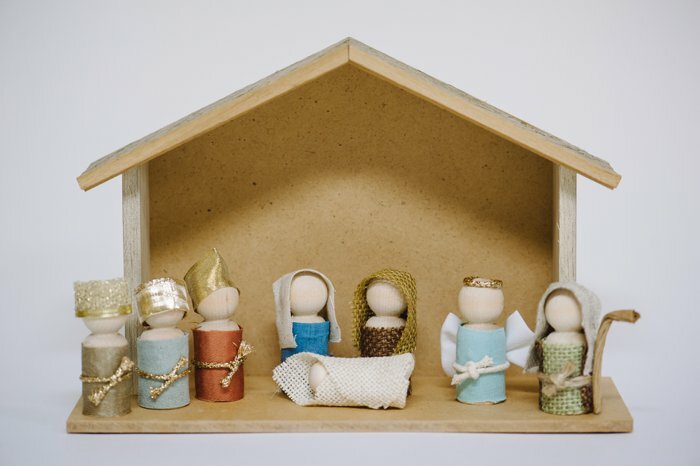 Wooden creche or stable – buy one on Amazon: option 1, option 2, or Etsy: option 1, option 2, or make your own. 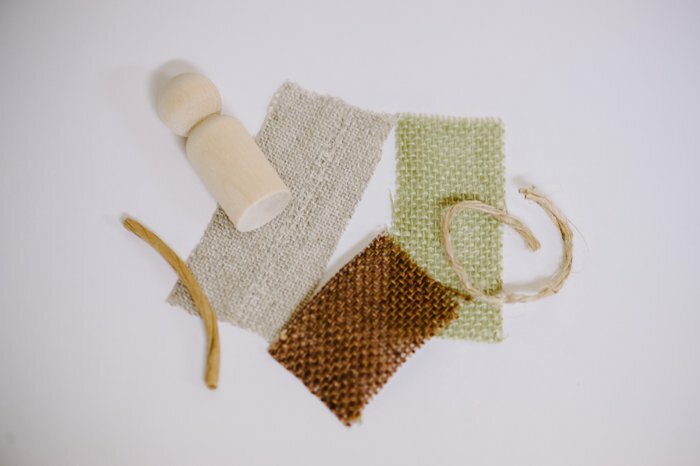 I looked at the fabric in my craft room, and chose natural, rustic fabrics. 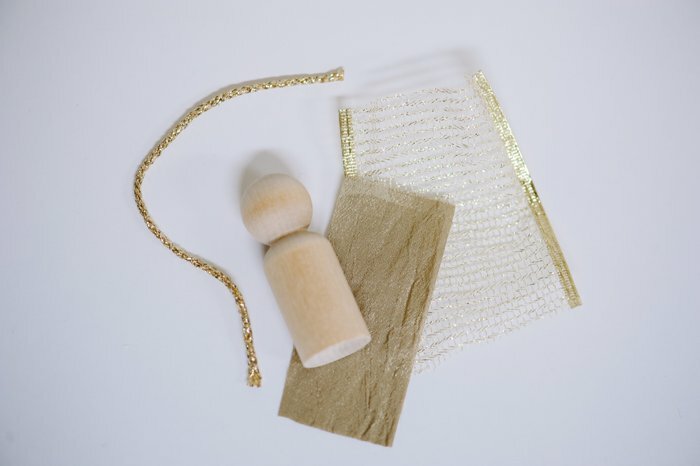 I also used metallic ribbons for the wise men crowns, as well as twine, string and thin rope for the belts. 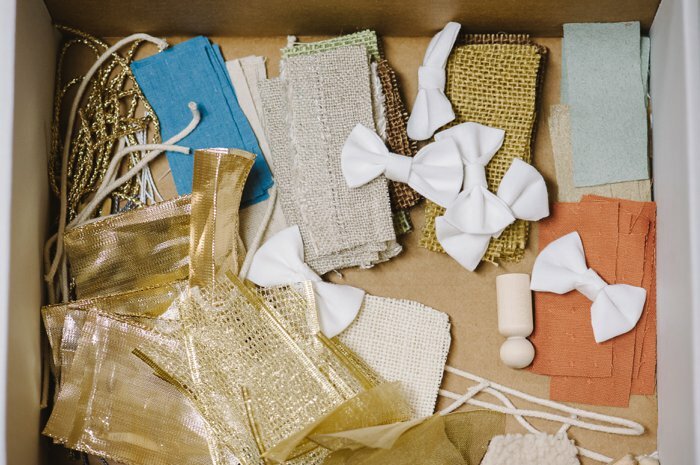 As you’ll see below, all of the clothing is created from fabric that is cut into simple rectangles. 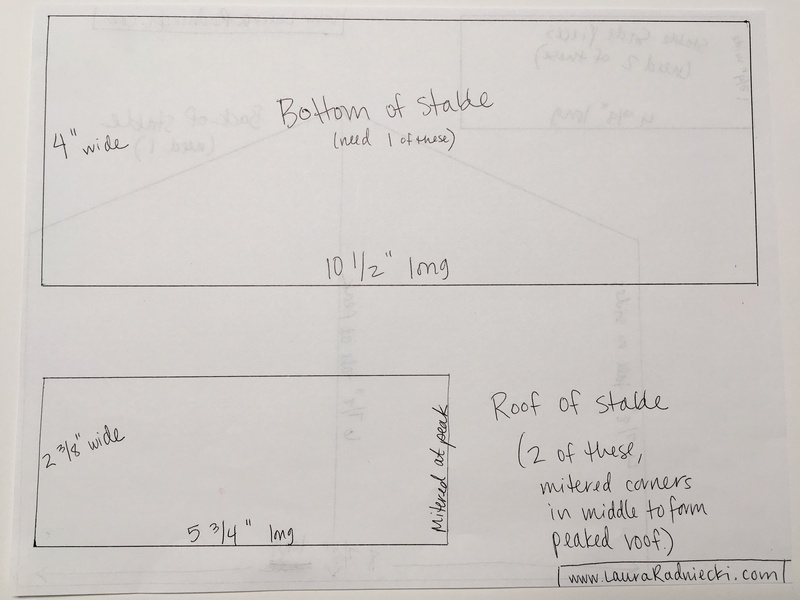 I don’t have exact measurements for the rectangle pieces that I cut, but I’ll mention some pointers as I go through the different people. 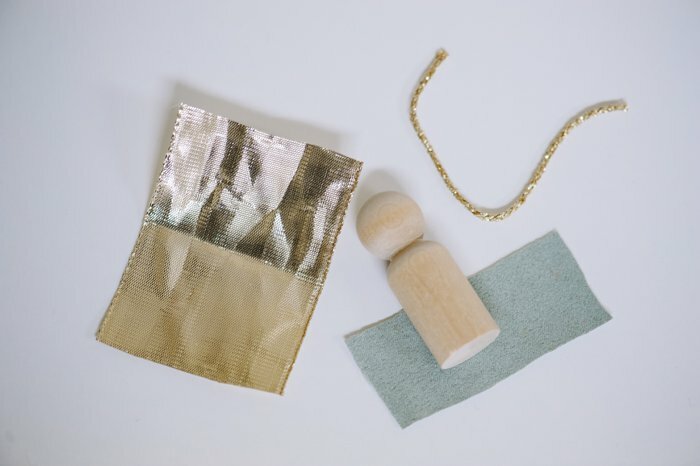 Here are the pieces needed to create Mary. I also used hot glue as my adhesive. 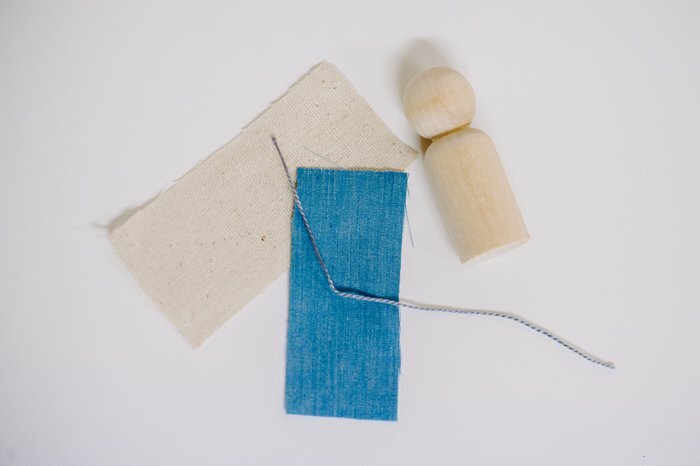 A note about the hot glue – I found that the hot glue isn’t terribly durable if you try to pull the fabric off of the wooden body. It WILL come off. It doesn’t seem to stick real hard to the wood. But I also tried super glue, Elmers and E6000 glue, and none of them worked any better. So, I decided to continue using hot glue because it was the easiest [and least smelly – E6000 glue STINKS]. I also figured that when Raleigh is old enough to play with this set, he will hopefully understand that he shouldn’t peel the clothes off. If he does, I can easily re-glue them back on. The body fabric should be as tall the body. The length isn’t as critical because you can trim it if it’s too long. You want it at least long enough to wrap all the way around and overlap a little on the back. Step 1: Glue the body fabric around body, and glue the seam down in the back. Step 2: Wrap the belt around the body and knot it. I put a tiny dab of glue behind the knot to secure it. Step 3: Attach the head covering. This was a bit of a mystery to me at first, and I tried a few different methods before I figured out what worked best. 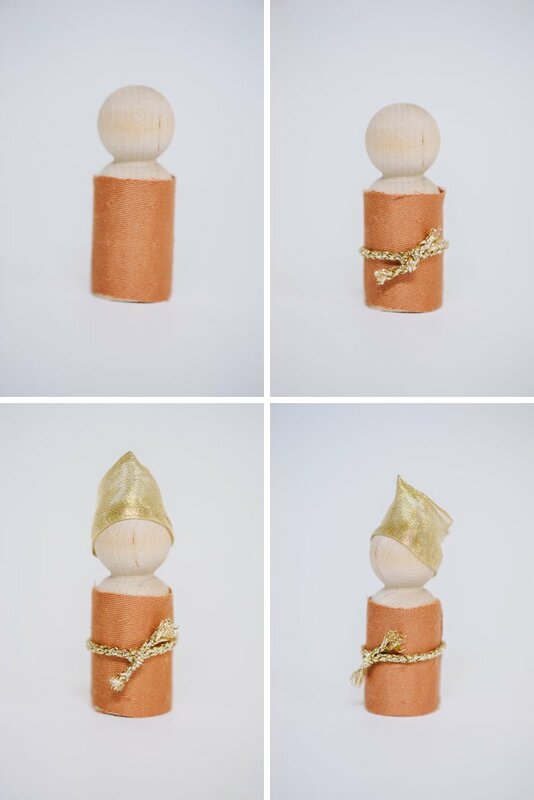 See the photos below for a step by step view of how to attach the head covering. Step 1: First, cut a rectangle piece of fabric that is slightly bigger than the body piece you used. You can see the size comparison in the photo above, showing the two pieces I used. Step 2: Put a dab of glue in the middle of the back of the head. 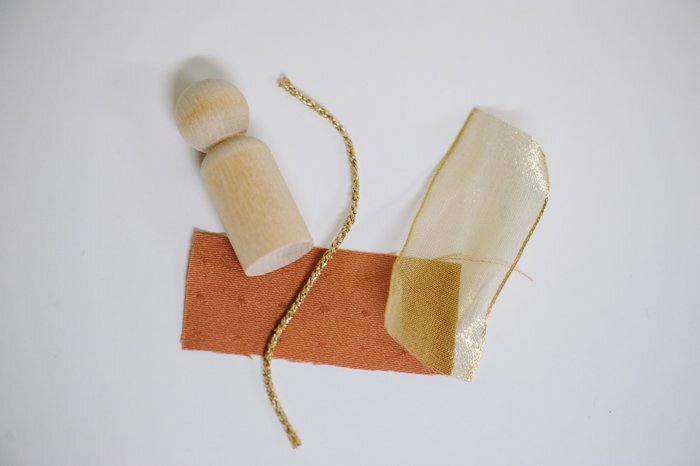 Press the fabric down into the glue, as shown in the middle photo below. Step 3: Next, put a vertical line of glue right in the middle of the back of the head/shoulders. Take one corner of the back of the head covering and fold it in and push into the glue. Put another vertical line of glue down the middle and fold the other corner in, securing it into the glue. [As pictured in the lower right photo.] The finished product should have the head covering wrapping around the back and being secured with glue. Simple and yet just the sweetest. The process of making the rest of the people is largely the same as it was for making Mary. I cut them into similar sizes as the pieces for Mary, and they are glued on the same way. Step 1: Glue on the body fabric. Step 2: Tie on the belt. Glue beneath the knot if desired. Step 3: Attach the head covering the same way as Mary’s. Step 4: You’ll notice in the above left photo that the corners of the head covering flare out. 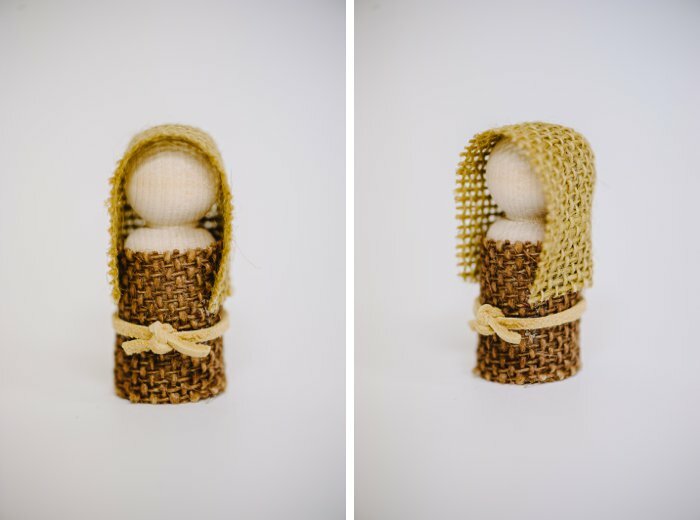 Because the burlap is so much stiffer than the fabric I used for Mary’s head covering, it didn’t lay flat like Mary’s did. So, I put a small dot of glue on the inside of the two corners of the head covering, and pressed them against the sides of Joseph’s body. That allowed the head covering to lay nicely as shown in the above right photo. I liked the leather belt combined with the rustic burlap. Twine would have worked well too. The pieces needed for the shepherd are the same as Joseph, but I added a robe to his outfit. I also added a curved staff so it would be clear what he was, and help differentiate him from Joseph. Shepherd’s staff – I used a twisted piece of brown paper-like material I had in my craft supplies. I honestly don’t know what it is or what it’s really meant for. 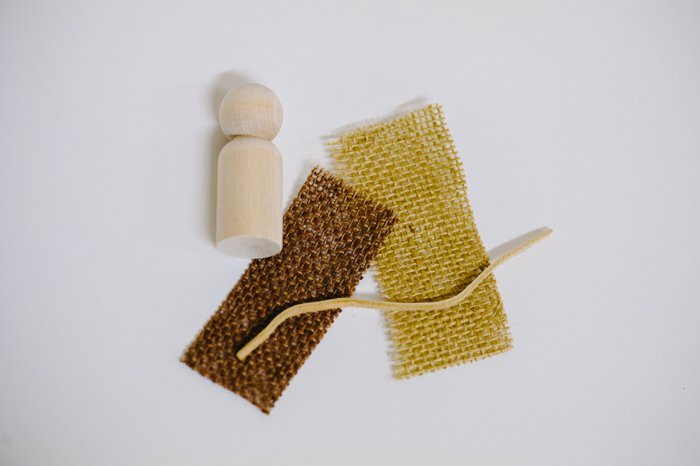 You could use a small piece of wood, a stick or branch, cardboard, or even soak twine in glue or some other substance like Mod Podge and let it dry and harden into a curved shape. Step 1: Glue on body fabric. Step 2: Glue robe on over body fabric. Step 3: Attach belt and glue behind knot if desired. Step 4: Attach head covering. Step 5: Glue shepherd staff to the side of the body. 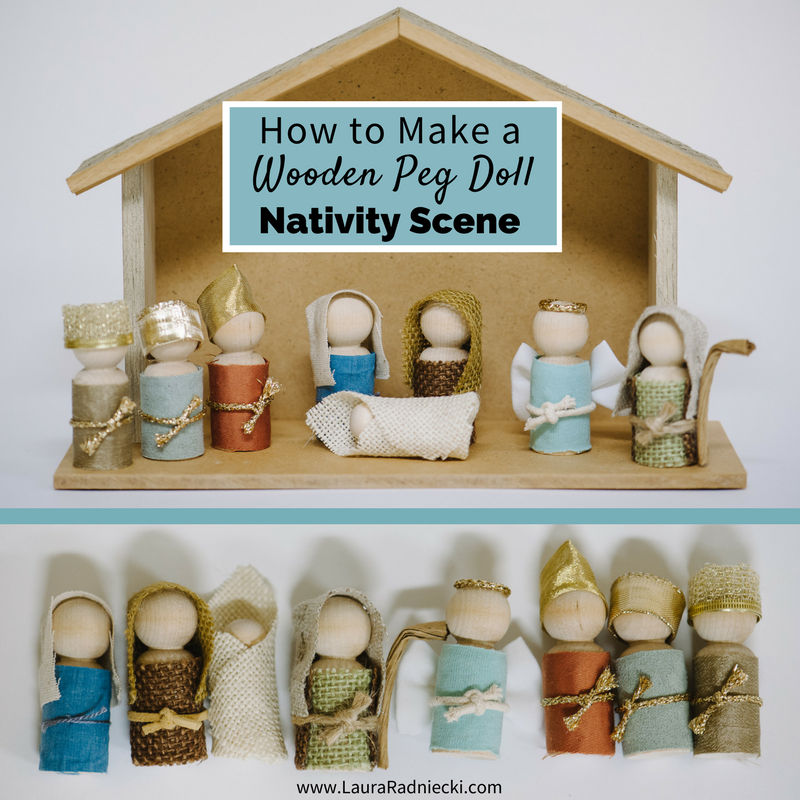 For Baby Jesus, I used a 1 11/16″ wooden peg body instead of the larger 2 3/8″ wooden bodies I used for the rest of the people. I tried several different fabrics and wrapping techniques for Baby Jesus’ swaddle and most of them looked lumpy and ugly. 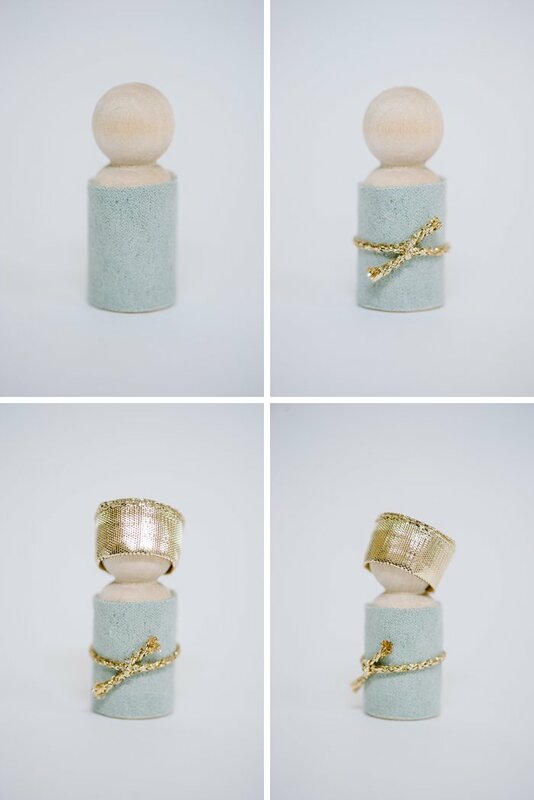 I finally settled on the cream burlap because it matched the rest of the pieces and was the easiest to wrap. Step 1: Cut the blanket burlap into a square and trim the bottom corner off to make the swaddle fit better. 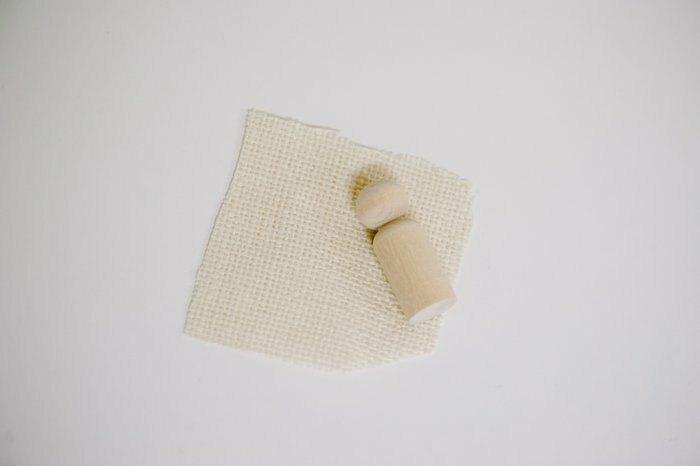 Step 2: [Not pictured] – Lay the wooden peg in the middle of the fabric and put a bit of glue in the middle of the body. Fold up the bottom corner you trimmed off and secure it in the glue. The next part of the scene is the Angel. I experimented with the best way to make the wings. My first try was using a slippery, silky fabric I had leftover from my wedding decor. It didn’t work out well; it made uneven wings. I decided to try to make a simple bow out of white cotton fabric. I forgot to take pictures of this process, but I used a method similar to this tutorial. I didn’t sew it though; I glued it all. Step 2: Attach belt. Glue behind the knot if desired. Step 4: Attach halo in a circle on top of the head. I placed a thin line of glue and laid the string in it, making sure the ends met in the back. 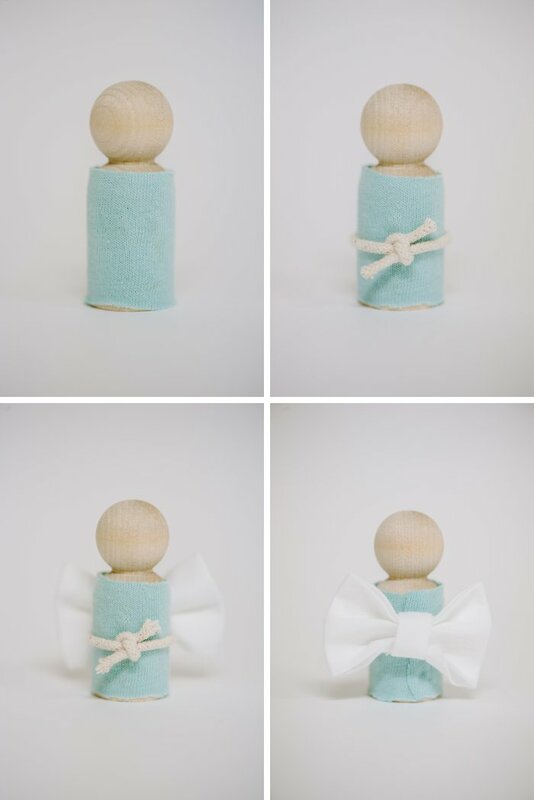 SAVE THIS CRAFT IDEA FOR LATER! The pieces for the three wise men are similar to the rest, except the head coverings are different. 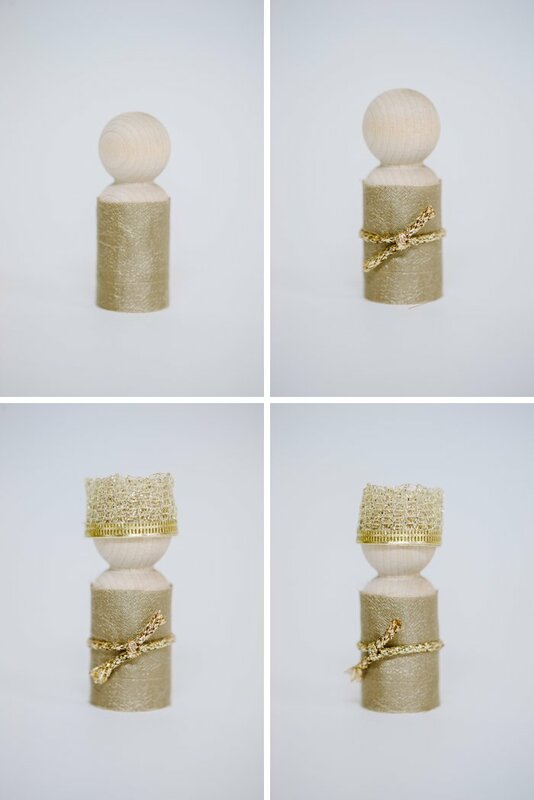 I made crowns for them out of pieces of metallic ribbon. Step 3: Glue on crown. I used the same method for the third wise man’s crown, just with different ribbon. Mary, Joseph, Baby Jesus, The Shepherd, The Angel, and the Three Wise Men. I debated on trying to make a sheep, but I decided against it because I couldn’t figure out how to make one with the supplies I had, without it looking dumb or out of place. 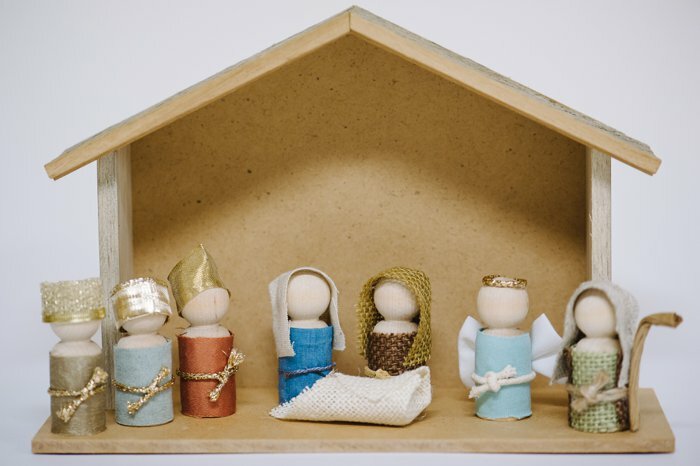 In the post that I used as inspiration, the blogger talks about the creche she found in the Target dollar spot, as well as a couple other options. She also included a simple blueprint if you wanted to make your own. 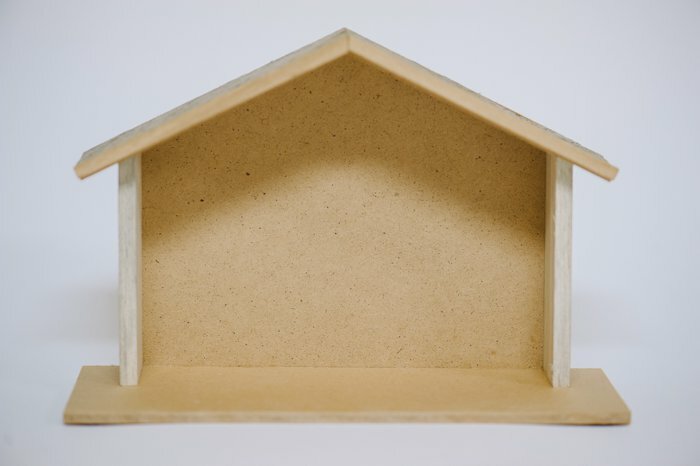 With my dad’s help, we make our own stables for my Nativity scenes. If I didn’t have his help, I would have likely bought them off of Amazon or Etsy. 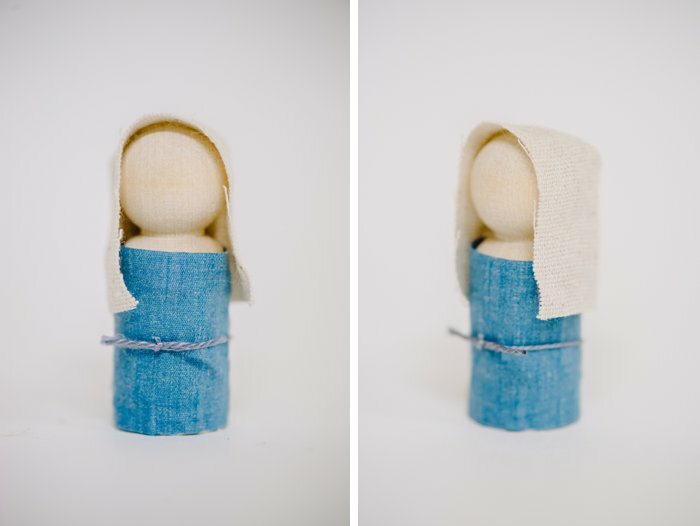 The finished handmade wooden pegdoll Nativity Scene! It’s rustic, humble, emotionally sentimental, and yet so classic and cute. I envision Raleigh playing with it during Christmas time, rearranging the people into different orders. I also hope to use it to teach him about the Christmas story and the birth of Baby Jesus. Plus, I think it makes a great piece of timeless Christmas decor too. I put the wooden people in a 5×7″ drawstring bag, and laid the bag inside the stable for storage. It’s not all that big; the stable is less than a foot wide. It fits easily into my tub of Christmas decor. Projects can be a bit of gamble when you are trying to recreate something you saw on Pinterest. But sometimes, you end up pleasantly surprised. The outcome is sometimes even better than you imagined! That’s how I feel about this DIY Nativity scene. I had high hopes for it, but there is something about the finished product is even better than I hoped it would be. Your way of describing the things step by step is really nice. I have a collection of nativity sets which I bought from http://holylandimports.net/, they have a huge collection of nativity scenes, ornaments etc. I like your article, I will try these steps at home. Holyland Imports has beautiful products too. Thanks for pointing them out! Quick question, do you have the tutorial on how to make the stable? Unfortunately no, I don’t have a tutorial on how to make the stable. But I did measure mine and drew up some measurements/templates of the different pieces and added that to the tutorial in the stable section. I hope those drawings might be of some help to you! Good luck! This tutorial was so helpful and incredible. And much like you, I found I loved it even more than I thought I would! So simple, yet beautiful. I’m so happy to hear you love the nativity just like I do! I completely agree on it’s simplicity and beauty! 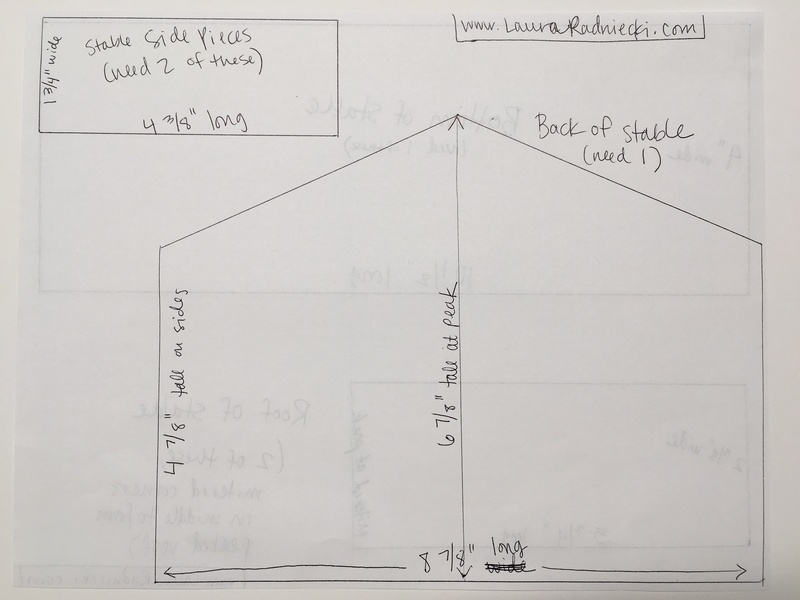 I looked at my stable and took some measurements for you, and drew them on a piece of paper. I added them into the tutorial in the section on the Stable. I hope that helps your friend make your stable! I’d love to see your finished product! I can’t say how beautiful this nativity is to me! I adore the simple way it calls out to me in such a big way. Thank you for sharing your set, I am going to work on this with the kids tonight! 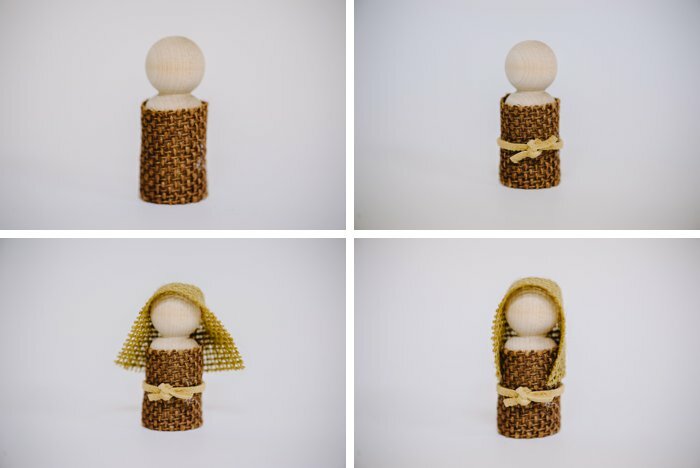 Thank you so much for sharing your thoughts on the nativity set with me! I appreciate your sweet words so much! 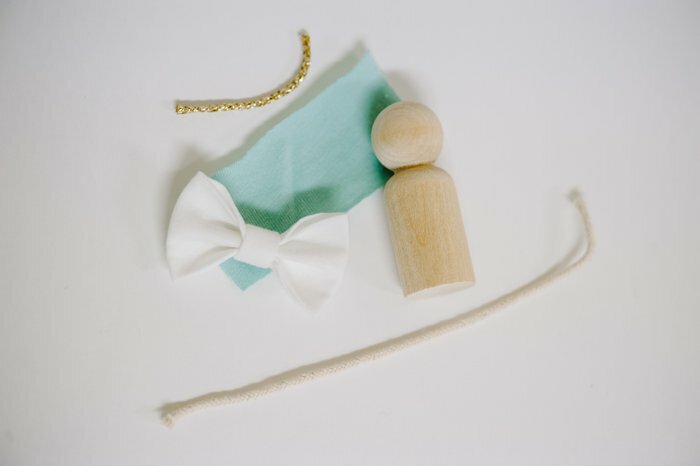 Did you start making your own set with your kids? Let me know how it turns out!